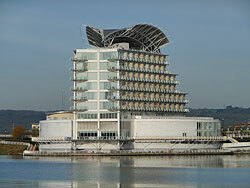 St Davids Hotel & Spa is a landmark luxury hotel located in the heart of the Cardiff Bay area. The large sail like structure adorning its roof make this hotel visible from miles around. There are 132 guest rooms in all, each having their own balcony offering either a bay view or a city view. The facilities at this 5 star hotel are second-to-none and include a hotel restaurant offering the very best in contemporary cuisine, a hotel bar, a full leisure complex and of course a spa. When the great and the good come to Cardiff this is where they stay. Highly impressive location, situated on Cardiff Bay waterfront. Luxury hotel offering the highest levels of service. Close to the Wales Millennium Centre and the Welsh Assembly Building. Award-winning Tides Grill offers tempting and delicious dishes using the finest, seasonal produce. Tides Bar offers light snacks and refreshments in a sophisticated atmosphere. Luxury spa facilities include: swimming pool, cardiovascular gym, 14 treatment rooms, spa lounge, open air terrace and relaxation room. Wide array of conference and banqueting facilities available. Popular venue for wedding ceremonies & celebrations.